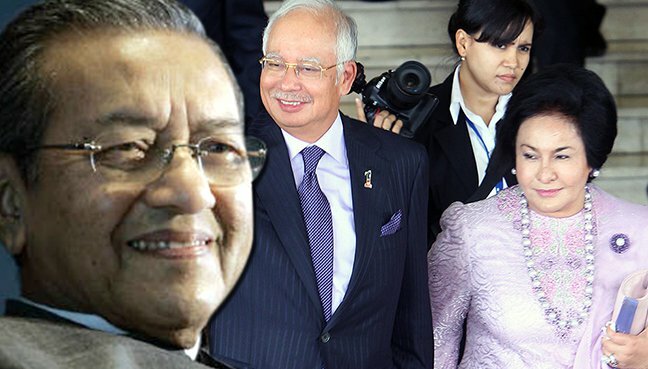 Dr Mahathir Mohamad has once again targetted Prime Minister Najib Abdul Razak’s wife, Rosmah Mansor. Disclosing that he has received complaints about her, he said among the grouses is that she behaves like the prime minister instead. The former premier said those who complained about her were not only Malays and Umno members, but Chinese as well. “They are not comfortable with Najib’s wife, her lavish lifestyle and her behaviour as if she is the prime minister,” he added in his latest blog post. Mahathir also claimed that numerous groups and individuals had expressed concern about Najib’s leadership and urged him to do something. “They came repeatedly and asked me to do something so that Najib would stop his policies and approaches,” he added. Following this, the former premier said he attempted in vain to advise and reprimand the prime minister. “He (Najib) is confident about his approach, that giving money would entice the people. He truly believed that the people love him. “He believed that although Umno and BN are not popular, he is well-liked and would become an idol and icon. “He believed the mammoth rallies with ‘I Love PM’ placards proved how much the people liked him,” added Mahathir. Mahathir said he was overwhelmed with calls to make Najib realise that support was eroding and there is “hatred” towards his actions as well as his wife’s lavish lifestyle. “‘Do something,’ they told me. I replied that I have but it is not effective,” he added.